Cozy Knot Top Just $16.99! Down From $50! Shipped! 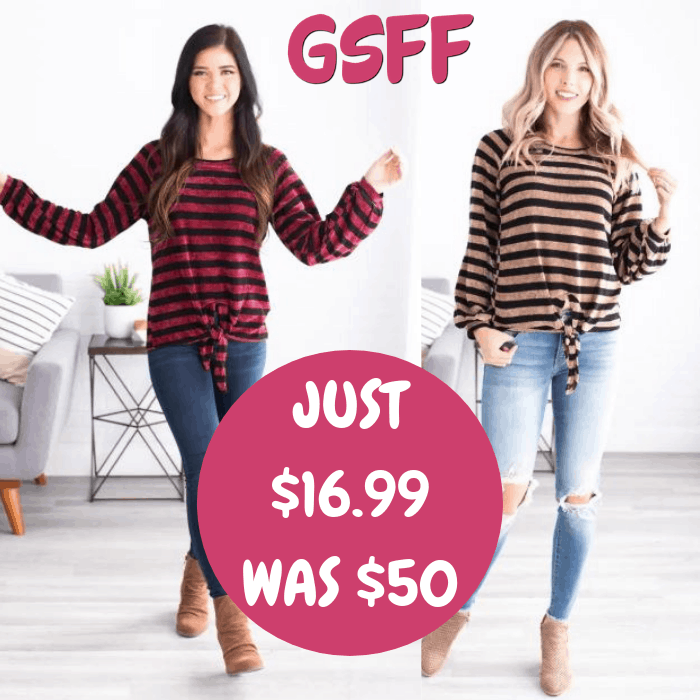 You are here: Home / Great Deals / Cozy Knot Top Just $16.99! Down From $50! Shipped! TODAY ONLY! Hurry over to Jane where you can score this Shiloh Cozy Knot Top for just $16.99 down from $49.99 PLUS FREE shipping! Who doesn’t love a good knot top? You can’t get enough of this new Shiloh Cozy Knot Top! This top features a stunning striped design, knotted bottom and long sleeves! It is so cozy and soft you’re sure to find a way to wear it all season long! You’re gonna love wearing it with some comfy leggings or these favorite pair of skinnies!